A sycamore leaf (Macginitiea wyomingensus) displayed at the Smithsonian National Museum of Natural History. 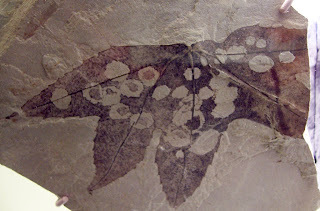 The splotches on fossil are insect mines. Display text shown as "An insect larva burrowed the tunnels or mines on this sycamore leaf." Leaf is from Eocene Epoch (Paleogene Period) about 45 million years old.